Joachim Heinrich Campe’s pedagogical work Robinson der Jüngere (1779/1780) represents one of the most important and popular educational works of the European Enlightenment. 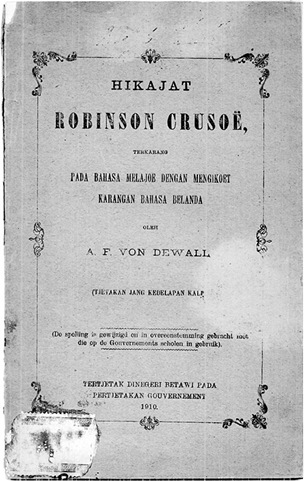 It is not widely known that this work was translated into Malay as Hikayat Robinson Crusoë (1875) and into Tagalog as Ang Bagong Robinson (1879) in the late nineteenth century. This paper attempts a preliminary comparative analysis of these translations with a particular focus on the problem of translating concepts from political economy into Tagalog and Malay. Daniel Defoe’s (1660–1731) novel with the full title The Life and Strange Surprizing Adventures of Robinson Crusoe of York, Mariner: Who lived Eight and Twenty Years, all alone in an uninhabited Island on the coast of America, near the Mouth of the Great River of Oroonoque; Having been cast on Shore by Shipwreck, wherein all the Men perished but himself. With An Account how he was at last as strangely deliver’d by Pirates. Written by Himself, otherwise more briefly known as The Life and Strange Surprizing Adventures of Robinson Crusoe or even just Robinson Crusoe, was first published in 1719 and is considered to be the first English novel. Due to its great success among the reading publics of Europe, it also became one of the most well-known and widely translated works in world literature. The mythos of Crusoe attained such a degree of popularity in eighteenth-century Germany that the term “Robinsonade,” referring to a distinct literary genre, was coined by the writer Johann Gottfried Schnabel (1692–1758) as early as 1731 to refer to works sharing similar themes and premises (Schnabel 1994). An enormous amount of critical and scholarly material on German literary Robinsonades accumulated up to the end of the twentieth century (Wegehaupt 1991; Stach 1996). 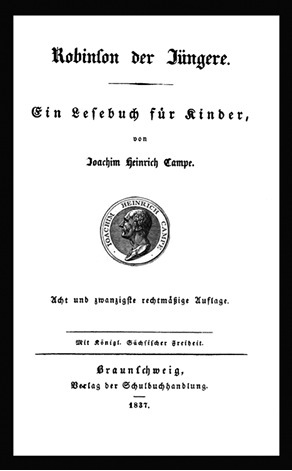 Among the eighteenth-century German Robinsonades, the most popular and most successful on a Europe-wide scale was a two-volume educational work by the Enlightenment pedagogue Joachim Heinrich Campe (1746–1818) titled Robinson der Jüngere: Zur angenehmen und nützlichen Unterhaltung für Kinder (The new Robinson: Agreeable and useful entertainment for children, 1779–80) (see Fig. 1). The title alone indicates a new attitude to the pedagogical practice of the time, which considered “useful” and “entertaining” as irreconcilable opposites. Campe was one of the most prominent figures in the German Enlightenment and was well known throughout Europe in the nineteenth century for his innovative edu­cational and linguistic theories. He began his career as the tutor of the future naturalist and explorer Alexander von Humboldt (1769–1859) and his brother, Wilhelm von ­Humboldt (1767–1835), who would become an important founder of historical linguistics, a philosopher, and a politician. (Interestingly enough for the present study, the latter would end up writing some of the most important and pioneering early European studies on Malay and Tagalog.) Campe was part of an eminent group of educators that included Johann Bernhard Basedow (1724–90) and Christian Gotthilf Salzmann (1744–1811) and was heavily influenced by Jean-Jacques Rousseau’s educational novel Émile, ou De l’éducation (1762). The group were known as the “Philanthropen” (those who love humanity), and their educational approach was called “Philanthropismus.” They frowned upon rote learning and corporal punishment, criticized the authoritarianism of adults in the learning process, and rejected the treatment of children as “small grown-ups.” Campe was also a well-known and effective advocate of what is today disparagingly called ­“linguistic purism” (Sprachreinigung). His reasons for advocating the above position on language use were consistent with his Enlightenment beliefs in human emancipation, democratization, and pedagogical effectivity. One of the representative philosophical works defining Campe’s educational outlook in the context of his time was the short study Von der nöthigen Sorge für die Erhaltung des Gleichgewichts unter den menschlichen Kräften (On the necessary concern for the preservation of balance among the human powers, 1785). It was during the 1770s, when he ran a school in Hamburg along “philan­thropist” lines, that he produced his free “Rousseauist” version of Robinson Crusoe, titled ­Robinson der Jüngere, considered the first work of German literature intended for ­children. Rousseau had famously written that the first book the student Émile would read would be Robinson Crusoe, a book that according to him was the best treatise on “natural education” (Rousseau 1882, 131–132). Campe’s adaptation of Defoe’s plot is supplied with a frame story of a father telling the story to his children, his wife, and some of their friends. As a literary work for children, Campe’s rendition emphasizes a more explicitly didactic and moral function. Looked at from the practical side, the story is divided into 45 parts, each of which is short enough for evening reading sessions with children. The central, and in Campe’s view quite crucial, distinction between his and Defoe’s works is that where Defoe’s Robinson has at least a gun, some tools, food, and drink to get him started, Campe’s has nothing but the clothes on his back and some songs he has learned by heart. Indeed, some readers better acquainted with this type of environment would find it quite strange how easily Campe’s Robinson is able to satisfy his ravenous hunger after washing up on the island without any tools to help him open oyster shells. He also seems to have plucked and eaten coconuts just like apples from a tree. 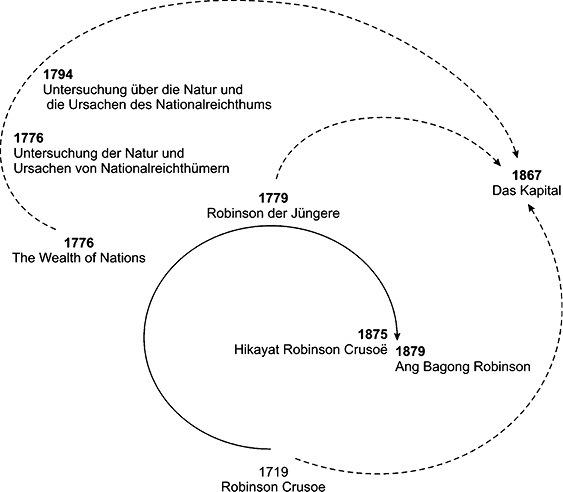 Though Robinson der Jüngere was soon eclipsed in the English-speaking world by Johann David Wyss’s (1743–1818) phenomenally successful Der Schweizerische Robinson (1812–13), more famously known under the title Swiss Family Robinson (ibid., 79ff), Campe’s novel would be read and translated into innumerable languages, including Malay and Tagalog, throughout the nineteenth century. 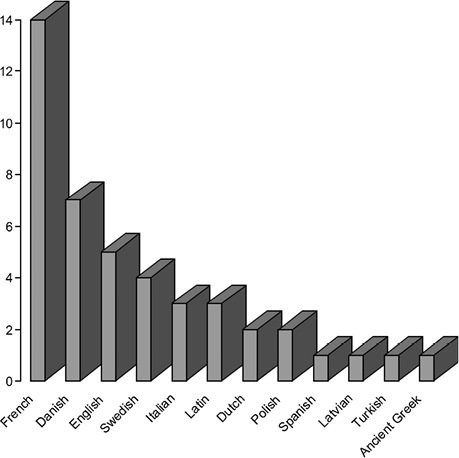 Data gathered from Hermann Ullrich’s (1898) bibliography of Robinson Crusoe and various other Robinsonades spanning the period 1770–1870 (not including the Tagalog and Malay translations) shows that RDJ was translated into at least 12 languages during that period, most often into French (with 14 translations), Danish (7), and English (5). Relevant to the present study are the two translations into Dutch and one translation into Spanish. Ullrich estimates that 117 German editions of RDJ were printed until 1894, but he unfortunately does not include data on the many abridgments of Campe’s Robinsonade upon which the Malay translation may have been based (see Figs. 2 and 3). Although this is beyond the scope of this study, it might be interesting to note that for the period 1900–90, Reinhard Stach (1996) was able to identify at least 111 editions, adaptations, and abridgments of Campe’s work (with available years of publication). Of this total, 93 appeared between the end of the first decade of the twentieth century and the 1940s, after which there was a sharp decline. In 1875, Joachim Heinrich Campe’s Robinson der Jüngere was translated from Dutch into Bahasa Melayu as Hikayat Robinson Crusoë by the “Indo” (Eurasian) Adolf Friedrich von Dewall (or Von de Wall). He was born in Cirebon on April 28, 1834, and died in Jakarta (formerly Batavia) on July 6, 1909. His father, Hermann, was a German (which explains the “von” in his name instead of the Dutch “van”) employed as a government official in West Borneo, where the young Adolf grew up, it is said, “almost like a native” among the locals. When Adolf entered government service, his mastery of Melayu and sufficient grasp of both Sundanese and Javanese led him to be assigned to work as an official translator of adventure stories and popular scientific works intended for educational purposes (Molhuysen and Blok 1930, 386). Second, it turns out that one of the most pressing problems in analyzing HRC as a relay translation is in establishing its immediate Dutch language source text. The title page of HRC only indicates the source language to be Dutch but does not specify the title of the Dutch edition that served as the main source text. This is a more pressing issue with respect to HRC than ABR because the Malay version represents a significant abridgment of RDJ along with several, not insignificant, textual revisions. HRC has no chapters and is one long text. The framing story of RDJ has been removed, chapters and other divisions have been eliminated, the long subplot about Friday’s father has been deleted, and almost every aspect of the text has been simplified or made more compact. Chapters 20, 25, 27, and 28 are completely omitted from HRC. The Malay text perhaps adds up to only one-fourth or even less than the original length of RDJ. A sentence-by-sentence comparison shows that only an average of 38.45 percent of content per chapter has been retained from each of the 30 chapters of RDJ (see Fig. 5). Jedamski (2009, 199) has proposed the source text as being Gerard Keller’s trans­lation titled Geschiedenis van Robinson Crusoe verkort (The abridged story of Robinson Crusoe, 1869). An interesting sidelight to the history of HRC is that Von de Wall’s translation was considered attractive enough to be published twice without proper attribution by other people claiming to be its author in the daily Bintang Sorabaia (Star of Surabaya)—the first time in 1888–89 and the second, under the false title Hikayat Anoewari, anaknja saorang miskin (Story of Anoewari, son of a poor man), in 1901–2. Jedamski gives details on the reactions of some readers to these attempts at plagiarism (ibid., 177–179). Joaquin Tuason, the Tagalog translator of Campe’s Robinson der Jüngere (1879), was born on August 19, 1843, and died on September 27, 1908. Despite his being one of the most prolific and well-known Tagalog writers of the nineteenth century, relatively little is known about him. Modern literary prejudices against “mere” translators and authors of religious works have ensured his slide into obscurity. He was the son of a landowner-merchant in Pateros and received schooling at the Ateneo Municipal de Manila (Mojares 2006, 430). He worked as a translator of Spanish religious and moral treatises and also wrote poetry in his own right from the mid-nineteenth to the early twentieth century. Among his works, Matuid na Landas Patungo sa Langit (Straight path to Heaven) was the most popular and was printed in 10 editions after its initial publication in 1869 (Quirino 1995). For a relatively complete bibliography of Tuason’s works, see Manuel (1955). His translation of RDJ was titled Ang Bagong Robinson, historiang nagtuturo nang mabubuting caugalian, na guinauang tanungan nang icatuto at icalibang nang manga batang babayi,t lalaqui (The new Robinson, a story that teaches good conduct, that has been made into a question and answer form so that girls and boys can learn and be entertained) (see Fig. 6). Like the Malay version, Tuason’s translation was not translated directly from German but was a relay translation from Tomás de Iriarte’s (1750–91) El Nuevo Robinson, which was first published in 1789 and reprinted in 1804 and 1811 (Ullrich 1898). Iriarte’s translation is said to have been a popular textbook in Spanish schools long before Defoe’s original was finally translated into Spanish in 1835 (Pym 2010). In his “Translator’s Prologue,” Iriarte heartily recommends Campe’s version while praising the “justified banning” of Defoe’s Robinson by the Tribunal de la Fé in 1756 and inclusion in the Index librorum prohibitorum due to its abundance of “dangerous maxims” (peligrosos máximas) (Campe 1820, IX). He also informs the reader that he took the liberty of suppressing, adding to, or changing Campe’s text in not just a few places to correct some factual errors, clarify some ideas that seemed too difficult for children to grasp, and reduce the number of bothersome digressions and repetitions (ibid., XII). One of his interventions is to correct Campe’s description of llamas having “humps” (corcoba). He also adds a long, “more scientific” discussion about lightning (ibid., 125–127), to which Tuason in turn adds a footnote about lightning in the Philippines. Iriarte’s prologue (also partially translated by Tuason) ends with long quotations from Inca Garcilaso de la Vega’s (1539–1616) account of the life of Pedro Serrano, a Spaniard shipwrecked on a desert island, which is considered one of the many literary precursors of Robinson Crusoe. The differences between its presumed French source (by an anonymous translator) and ­Iriarte’s translation have been closely scrutinized by Marizzi (2008). He discovered that the originally informal modes of address used by the children to address their parents had become formal in Iriarte, and that the letters written by the children no longer used childish language as in the French and German versions but had become filled with “horrible formalisms.” Their speech had also departed from Campe’s deliberately simple language and were now replete with complex grammatical constructions. Contrary to Campe’s effort to use German terms that could be understood by ordinary people, ­Iriarte’s text is peppered throughout with “learned words” (cultismos). Marizzi’s opinion is that these changes reveal differences between the Spanish and German reception of Enlightenment ideals. 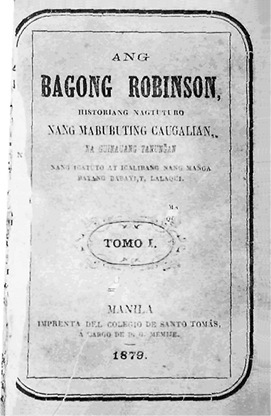 Tuason’s Ang Bagong Robinson was the second work in novel form, after the Tagalog translation of Enrique Perez Escrich’s El Martir de Golgota in 1872, to be introduced to a Tagalog reading public. Significantly, the Tagalog translation was commissioned and published by the Dominican Colegio de Santo Tomas. Though there were Spanish editions in several formats, including single-volume, two-volume, and three-volume ones, the edition upon which the Tagalog translation is based is probably the 1846 edition, because its first volume is made up of the first 13 chapters, unlike the original German version, where the first volume consists of only the first 11 chapters. The second volume of this Spanish edition contains chapters numbered 14 to 31. The second volume of the German edition contains chapters 12 to 30. The reason there is one additional chapter in the Spanish edition is that the 17th chapter corresponding to the German edition has been broken into two chapters. Each chapter in the Spanish edition is titled “Tarde” (afternoon), which explains why the Tagalog translation has chapters titled “Afternoon” (hapon) rather than “Evening” (Abend) as in the German original. The Tagalog translation follows the 1846 Spanish edition closely with respect to the division of volumes and chapter numbering (as Elmer Nocheseda observed in an email dated June 23, 2010). Tuason, like Iriarte, admitted to having made changes to the text: “In translating this work, I have removed what I deemed of no use to Tagalogs; in the same way, I added prayers to the benevolent Virgin whenever Robinson faces misfortune” (Sa pagtagalog nito,y, aquing linisan ang inaacalà cong uari hindi paquiquinabangan nang manga tagalog; gayon din naman aquing dinagdagan nang pagmamacaauà sa mapagpalang Virgen sa touînang daratnan si Robinson nang anomang casacunaan) (Campe 1879, 12).1) One example of such a change is the fate of Campe’s heavily modified version of the song “Morgengesang” (morning song) dating from 1757, written by Christian Fürchtegott Gellert (1715–69) and with music by Carl Philipp Emanuel Bach. Instead of being a straightforward Spanish version, the verses included in Iriarte’s translation constitute a totally different work from Gellert’s original. For his part, Tuason explains in a footnote that aside from his translation of the relevant verses from Iriarte, he has appended eight additional strophes in his translation. In these strophes he mentions “Virgen Maria,” “Ester,” “Joséng Esposo ni Maria” (Jose, the husband of Maria), and the “daquilang Arcángel Rafael” (great Archangel Rafael). Tuason’s additional explanatory footnotes are also worth mentioning in this context. For example, he adds a note in the sixth chapter commenting on the rarity of anyone being struck by lightning in Europe as compared to the “archipelago” (sancapuluan), where there is news of at least one person being struck dead by lightning every year (ibid., 157). In the 10th chapter, he explains that during the winter season (panahon nang taglamig) leaves fall from the trees, and the plants, seemingly dead, do not bear fruit (ibid., 240). A note in the 14th chapter on the mention of the “abedul” (birch) tree says, “these trees cannot be found here in the Philip­pines” (Ang man a cahoy na ito,y, uala rito sa Filipinas) (Campe 1880, 5). There are even such slippages as when the father/narrator in the story compares a fruit on Robinson’s island to a “guava fruit as we have here in the Philippines” (bayabas natin dito sa Filipinas) (Campe 1879, 117) and says that a llama is for the island “what a deer would be here in the Philippines” (na siyang pinacausá cung baga dito sa Filipinas) (ibid., 141). Iriarte uses the term “indio” to translate the German words “der Wilde” (the savage) seven times, “Freitag” (Friday) nine times, and “Indianer” (Indian) and “Amerikaner” (American) once each. Given the heavily loaded connotations of “indio” in the Philippine colonial context, where it referred to “pure natives,” it should be interesting to see how Tuason, who was himself a Chinese mestizo, reacted to it as a translator (this problem was posed by Elmer Nocheseda in an email dated August 4, 2010). He translates Iriarte’s usages of “indio” 11 times as “Domingo” (“Sunday,” Iriarte’s translation of the name “Friday”); 5 times as “tauong bundoc” (mountain people); and once each as “mabangis na tauo” (wild people), “manga caauauang tauo” (wretched people), and “indio.” (“Indio” appears in the Spanish text without a corresponding equivalent in the German original seven times, while it is left untranslated in the Tagalog text six times.) There is one instance where the text differentiates between Peruvian Indians, who are “civilized,” and the other “indios,” who are savages. Tuason is thus able to use the word in the sense of “civilized indios” in the sentence: “Isn’t it so that the Peruvians are not really savages like other indios?” (¿Cung sa bagay, ay ang manga perulero ay hindi totoong manga ­tauong damó na para nang ibang manga indio?) (ibid., 120). The Peruvians were indeed “indios,” but despite this they were not savages like “all the other” indios and instead were “truly civilized” (totoong man a sivilisado) (ibid., 121). In all other cases where “indio” refers unambiguously to savages, Tuason avoids translating the word or replaces it with “tauong bundoc” (mountain people) in five instances. The appellation “los indios bravos,” which was adopted by Jose Rizal and his friends, occurs once in Iriarte’s translation and is rendered as “mabangis na tauo” (savage people), which has the same meaning as the original term “die Wilde” (savages), which appeared in RDJ. “Salvage” (alternative spelling: “salvaje”) is translated into Tagalog as “tauong bundoc” 68 times, as “tauong damo” (grass people) 3 times, and as “tauong tampalasan” (vile people) in one instance. Quite puzzlingly, “tauong bundoc” and “tauong damo” do not actually fit into the island context but are rather pejorative terms for “uncivilized” people who have escaped from the Spanish colonizers by living in the mountains. Finally, Iriarte’s usage of “barbaro” (barbarian) is translated as “tauong bundoc” four times and as “tauong mababangis” (savage people), “manga tampalasan” (vile people), and “mga tauong tacsil” (traitorous people) once each (Fig. 7). Many interesting aspects of Tuason’s translation still have to be looked into, particularly in relation to Iriarte’s Spanish translation. Similar to Jedamski’s assessment of HRC, the literary historian Resil Mojares notes that the “bourgeois individualism” in Defoe’s original Robinson Crusoe appears to have been supplanted by religious virtues in Tuason’s rendition (Mojares 1998, 89). Without a doubt, Defoe’s original novel has far outlasted Campe’s version, despite the latter’s countless editions, translations, and abridgments, both as a far more complex work of art and in terms of popularity. The temporary advantages that the banning by Catholic censors of Defoe’s “dangerous” novel offered over the other “safer” Robinsonades sanctioned by Church and state authorities have long since disappeared. UNESCO’s Index Translationum (accessed November 4, 2013) lists 224 new editions and translations of Defoe’s novel into various languages from 2000 to 2012. There were only two translations of Campe’s version in the same period, one in Japanese (2006) and the other in Danish (2005). For its time, Campe’s extraordinarily successful Robinsonade was perhaps just as much an effort at rendering a version of Robinson Crusoe that could be more safely digested by German-style Protestantism, as it was an attempt to produce something more in line with the Rousseauist pedagogical aims of the Philanthropists. Iriarte’s very “Catholic” translation of Campe’s work, despite the controversy surrounding ­Rousseau’s Émile, must be considered as part of the early Spanish reception, generally mediated through French translations, of the pedagogical ideas he inspired in the ­German-speaking world among thinkers such as Campe himself and Johann Heinrich Pestalozzi (1746–1827). On the other hand, the reasons behind the translation of what appears to be a Christian treatise in a predominantly Islamic Dutch colony are perhaps murkier. (“Allah” is used consistently throughout the text to refer to “God”; “Tuhan” [Lord], on the other hand, is never used.) Doubtless, however, is the fact that both Von de Wall’s and Tuason’s translations must be understood, even with all their ideological distortions, deliberate omissions, and dubious additions, as further extensions overseas of the dissemination of German pedagogical Rousseauism, mainly through French translations. Any finite translation analysis cannot deal with all aspects of the texts in question but has to discover a conceptual point of entry or fulcrum. Finding and selecting a central point upon which to anchor the translation analysis requires a period of reflection on the textual materials. The preliminary analysis indicates that a useful point of entry in the analysis would be the comparison of the respective languages of “political economy” in RDJ, HRC, and ABR. This may seem somewhat odd given that Campe’s text is ostensibly a moral-pedagogical treatise. However, one of the major preoccupations of RDJ is the problem of the pressing needs that Robinson has as he is stranded on the island and the means by which he succeeds in satisfying these needs. Melani Budianta’s (2002) excellent study of the concept of “money” in Aman Datoek Madjoindo’s novel Tjerita Boedjang Bingoeng (The story of Bujang Bingung, 1935) has already shown the potential of this kind of “political-economic” approach to literary material. RDJ may, in fact, be one of the first texts translated into Malay and Tagalog with significant discussions on modern European economic themes. It can be noticed here that Marx mentions Robinson taming “llamas” rather than the “goats” that are more properly found in Defoe’s novel. This may lead one to suspect that Marx actually read Campe’s version, with its “humped llamas,” rather than Defoe’s version, with its hairy goats. It would, however, be rash to conclude this since Campe’s Robinson was a German from the city of Hamburg while Marx specifically refers to Robinson in the continuation of the passage above as being a “good Englishman” (güter Engländer). Robinson’s habit of keeping a journal, a fact that is central to Marx’s point, is also more pronounced in Defoe’s version. It may therefore be the case that Marx was familiar with both versions and his portrait of Robinson in Das Kapital is a kind of composite from Campe and Defoe. Ian Watt (1996, 178) even asserts that Marx poured his scorn on the economists who used Campe’s RDJ as an illustrative text and imagined it was the original version. Moore and Aveling’s (Marx 1961) English translation of Das Kapital supervised by Friedrich Engels replaced Marx’s reference to Campe’s llamas with Defoe’s goats. In Ben Fowkes’s (Marx 1976) translation, on the other hand, the goats are restored to llamas (see Fig. 8). Nevertheless, it would take a few more decades until Smithian economic ideas began to be genuinely understood and adopted in Germany, where cameralism still dominated the field of public administration, economic theory, and policy (Tribe 1995). Given that the first German translations of WN and RDJ are almost contemporaneous, it might be possible to take up Marx’s insight on the economic content of the ­Robinsonade as a literary genre in general so that this can be applied to RDJ, while carefully avoiding anachronism by using WN and its early German translations as the main discursive reference points. Although there are indications that Campe had some awareness of the prevailing economic doctrines of his time, it is not actually necessary to assume that he had read WN either in English or in German translation in order to compare the implicit economic ideas in RDJ to their nineteenth-century translations in Malay and Tagalog. It is sufficient that he was evidently dealing in some economic terms and notions in RDJ that were in general usage in the late eighteenth century. In another, earlier, scene RDJ dramatizes the notion of “exchange value” by discussing an example of commodity exchange. The term for “commodity” in German is “Ware,” and this is translated into the standard Malay and Tagalog terms in HRC (Mal: barang, barang dagangan) and ABR (Tag: bagay, calacal). According to the advice of the ship’s captain who agreed to take him on a voyage to Africa, Robinson should buy (Ger: einkaufen / Mal: beli / Tag: bili) useless and cheap objects that “give pleasure” (Ger: Vergnügen / Mal: disoekai / Tag: totoong naiibigan) to the Africans and exchange these with them for “gold” (Ger: Gold / Mal: ema s/ Tag: guinto), “ivory” (Ger: Elfenbein / Mal: gading / Tag: garing), and any other valuable items that they may possess. The captain convinces Robinson that these cheap wares can be sold at a price “one hundred times more . . . than they are worth” (Ger: hundertmal mehr . . . als sie werth sind / Mal: seratoes kali ganda harganya). Unlike RDJ and HRC, ABR says only that Robinson should buy “cheap” things for which he will “be paid at a really high price” (Tag: babayaran sa iyo nang totoong mahal) and explicitly mentions “profit” (Tag: tubo) in the phrase “make a great profit” (Tag: pagtutubuan nang malaqui). By “buying cheap and selling dear,” Robinson will become a “rich man” (Ger: ein reicher Man), “go home rich” (Mal: poelang-poelang kaya), or “make a great profit” (Tag: pagtutubuan nang malaqui) from the venture. The wealth of the merchant, as it is represented in RDJ, therefore comes from selling goods above their “real value” (Ger: Werth / Mal: harga). The category of “real value” in the exchange of commodities is explicit in RDJ (Ger: Werth) and HRC (Mal: harga) but only implicit in ABR, which speaks rather of “commodities” (Tag: calacal) as being “cheap” (Tag: mura) or “expensive (Tag: mahal). It is evident in RDJ that the “real value” of commodities is not simply identical with the rate at which they exchange with other goods; it may be lower (or higher) than the rate at which they are sold. But Campe does not give any further clue in RDJ as to how this “real” or maybe even “objective” value is determined. Although terms such as “use value” and “exchange value” do not directly appear in RDJ, the above examples clearly demonstrate the presence of these notions with reference to the “uselessness of gold” and the sense of the dubious origin of merchant profit, both of which are judged negatively by Campe from the religious and moral point of view of his time (Conze 1972, 166). Henryk Grossman, in his classic study titled “Die gesellschaftlichen Grundlagen der mechanistischen Philosophie und die Manufaktur” (The social basis of mechanistic philosophy and manufacture), posits the rise of the notion of “abstract homogeneous labor” (Grossman 1935, 190) in the eighteenth century during the development and spread of “organic manufacture” in Europe, which was characterized by the fact that the “work process is divided into the simplest, continually repeated and highly accomplished hand movements, where the result of the work of one worker is the starting point for the next one” (ibid., 184).5) Grossman’s opinion was that the most developed degree of division of labor represented by organic manufacture was the technological and social basis for the appearance of “abstract labour” as a concept in political economy (Marx 1956, 362ff). However, the translational problem is apparently not as straightforward as Biernacki portrays it. This matter can be investigated more closely by looking at all the translations into German of the phrase “demand for labour” in Chapter 8 of WN (titled “Of the Wages of Labour”). The earlier translation by Schiller uses “Verlangen nach Arbeit” (desire/demand for labor) consistently throughout to translate “demand for labour.” Schiller’s is quite a literal translation, but it did not enter into general usage. Garve’s translation, on the other hand, uses the phrase “Nachfrage nach Arbeit” (demand for labor; a phrase that would be absorbed into modern usage up to the present day) as well as “Nachfrage nach Arbeitern” (demand for workers) and “Nachfrage nach arbeitenden Händen” (demand for laboring hands). Furthermore, Schiller translates “division of labour” consistently as “Vertheilung der Arbeit” (division/distribution of labour), which emphasizes the abstract nature of the “labor” being divided up and is, according to Erik Erämetsä (1961, 39), the earliest translation of this concept in German. For his part, Garve translates it as “Theilung der Arbeiten” (division of employments) and “Vertheilung der ­Arbeiten” (distribution/division of employments), which fail to render the abstract nature of labor. (Marx uses the modern word “Arbeitsteilung” aside from “Teilung der Arbeit” in his own economic writings.) These examples demonstrate that Garve’s more popular translation is in fact worse afflicted with the problem of interpreting “abstract labor” than Schiller’s. The most relevant and extended passage on the social division of labor in RDJ unfortunately does not appear in HRC, because it is part of the framing story that has been deleted in the Malay translation (and presumably in the intervening Dutch trans­lation). 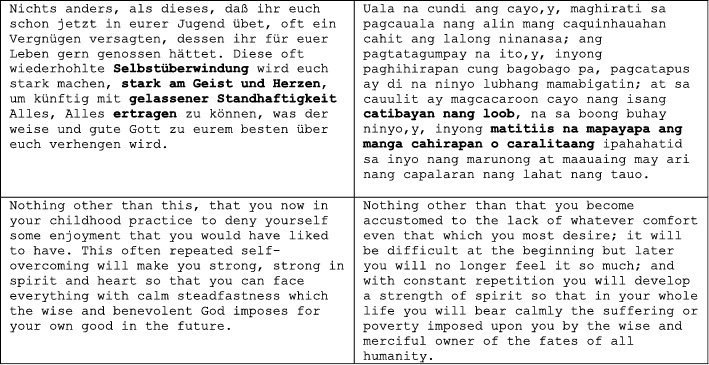 In this passage, RDJ and ABR expound on the “benefits” (Ger: Vortheile / Tag: capaquinabangan) of “social life” (Ger: das gesellige Leben / Tag: paquiquisama) and the “great difficulty” (Ger: unendlich schwer / Tag: laquing cahirapan) that “a single individual” (Ger: jeden einzelnen Menschen / Tag: isang tauo) would face if he “lived alone” (Ger: allein leben / Tag: mabuhay nang nagiisa) and had to “provide for all his needs on his own” (Ger: für alle seine Bedürfnisse selbst zu sorgen / Tag: matacpang magisa ang lahat nang cailangan) without the “help of other people” (Ger: Hülfe seiner Nebenmenschen / Tag: tulong na maaasahan sa ibang capoua tauo). It goes on to assert that “a thousand hands” (Ger: Tausend Hände / Tag: sanglibong camay) would not be enough to prepare what “each of us needs every day” (Ger: was ein Einziger unter uns an jedem Tage braucht / Tag: nang quinacailangan nang baua,t isa sa arao arao). (According to Erämetsä [ibid., 92], “Hände” [hands] acquired an additional meaning as “worker” due to the influence of the German translation of WN.) Campe uses the example of a “mattress” (Ger: Madrazen), the production of which requires stuffing, linen covering, glue, cloth, yarn, thread, flax, etc., in order to illustrate the point that an almost endless number of “hands” working in various specialized occupations are needed for the production of a simple object for a single child to sleep on. In addition to these, the “various kinds of labor” (Ger: vielerlei Arbeit / Tag: ang sarisaring paggaua) required in the production of the tools of the various occupations involved in making the mattress must also be taken into account. The benefits of a “social existence” are contrasted with the difficulties of Robinson, who must provide for his own needs “without any other hand except his own” (Ger: keine einzige andere Hand, ausser den Seinigen / Tag: ualang ibang camay na macatulong sa caniya) and with “not a single tool” (Ger: kein einziges von allen den Werkzeugen) to aid him. In a one-person economy in which exchange, and therefore a market, cannot exist, a division of labor among individuals is likewise ipso facto impossible. Robinson has to depend on himself alone to produce all the goods necessary for the satisfaction of his needs. Given this fact, the amount of time necessary for any additional work has to be carefully allocated with reference to all the necessary occupations within the “working day.” So when Robinson estimates that the “work” (Ger: Arbeit / Mal: pekerdjaan / Tag: paggaua) necessary for carving out a boat from a tree trunk with his primitive tools would take many years, he decides to consciously partition his time so that he has a particular task allotted for every hour of each day. In RDJ he devises “an orderly partitioning of the daily work hours” (Ger: eine ordentliche Eintheilung seiner Tageszeit) because he has learned by experience that “nothing advances and lightens our industry more than order and the regular partitioning of the hours of the day” (Ger: nichts mehr unsern Fleiß befördert und erleichtert, als Ordnung und regelmäßige Eintheilung der Tagesstunden). This is more or less reflected in ABR with the phrases “an orderly partitioning of his tasks” (Tag: maayos na pagcacabahabahagui nang caniyang manga gagau-in), because “nothing makes tasks easier . . . than a correct allotment of time” (Tag: ualang totoong nacadadali sa pagganap nang manga catungculan . . . para nang uastong pagbabahagui nang panahon). HRC makes this point implicit by stating only that Robinson decides to work “not more than two or three hours a day” on carving the trunk (Mal: ditentoekanlah dalam sehari tiada lebih dari pada doea atau tiga djam mengapak batang kajoe itoe) so that his “other tasks would not go to waste” (Mal: maka soepaja pekerdjaannja jang lain djangan tersia-sia). Granted that such an account of the human labor process may reasonably claim a trans­historical interpretation, Marx’s representation of it in these particular terms certainly could not have been conceived outside of the context of industrial society and the corresponding terminologies that grew out of it. If the relevant passage from RDJ is understood as an illustration of human “metabolic interaction” (Stoffwechsel) with “nature” or the “Earth” (Erde), then it could be seen as concentrating all the earlier economic themes into the structure of needs and productive labor as these developed in the late eighteenth and throughout the nineteenth century in Germany and other parts of Europe. Labor as an abstract potentiality is here understood as the confrontation of human beings with nature in order to satisfy their mounting and increasingly complex needs, thus necessitating the development of technology, complex organization (such as the division of labor), the reduction of socially necessary labor time, and so on and so forth. It could therefore be argued that “Bedürfnis” can serve as a point of concentration that draws together all the threads of Campe’s economic discourse in RDJ. The version presented in HRC of this passage is obviously quite different. “Hadjat” (desire/need) and “kesoesahan” appear in the corresponding translation as the equivalents for “Bedürfnis” and “kesoesahan” (difficulty/adversity) for “Noth.” Similar to the idea present in RDJ, “human beings” (Mal: manoesia) are said to be confronted with “kesoesahan” and imbued with various “hadjat,” which sharpens “thinking” (Mal: pikiran) and deepens “knowledge” (Mal: ilmoe). However, the HRC version does not translate “Erde” (“Earth,” or in this case “nature”) and “Erfindung” (invention). Because of these omissions, the macro-narrative of “mastery of nature” through human technology and “invention” does not seem to arise in HRC. The capacity for thought and intellection (Mal: pikiran), however, is developed to overcome all “difficulties” (Mal: kesoesahan), “reject” (Mal: menolak) all “danger,” (Mal: bahaja) and “to satisfy” (Mal: memenuhi) the various “needs” (Mal: hadjat). It seems that HRC refers to the sharpening of a skill rather than to the development of a technology in overcoming these difficulties and satisfying these desires. “Kesoesahan” and “bahaja” in HRC clearly refer to situations that, even though they may occur often enough, do not constitute the normal condition of things. “Hadjat,” on the other hand, may be interpreted to refer to a “longing” or “desire” beyond the more basic necessities of life (Wilkinson 1919). HRC therefore includes a qualifier of “hadjat” as having to be “decent/proper” (Mal: patoet). Although “hadjat” does also appear in such contexts as “to urinate” (Mal: membuang hajat kecil) or “to defecate” (Mal: membuat hajat besar), the use of this word in the language of the Malay hikayats in general seems to accord more with an elevated kind of “desire.” (Terms such as “longing” or “desire” can indeed be translated as “Bedürfnis” in German, but some other words such as “Begierde,” “Lust,” “Verlangen,” or “Begehren” have much closer connotations.) (The first translation of the first chapter of Marx’s Das Kapital in Indonesian [1933a; 1933b; 1933c], serialized in the newspaper Daulat Ra’jat, consistently uses “lack” [Mal: kekoerangan] as the equivalent of need; but toward the end of the first section, it suddenly becomes unsure and uses “lack/need” [Mal: kekoerangan (keboetoehan)]. The newest translation of the same work [Marx 2004; Guillermo 2013] uses “kebutuhan” throughout.) The quote from HRC therefore seems to refer to zones “below” (kesoesahan/bahaja) and “above” (hadjat jang patoet) the norms of everyday need; and being extraordinary experiences, these necessitate the development/advancement of thinking and of knowledge. On the other hand, the concept of Bedürfnisse in RDJ, whatever its subjectivization, refers neutrally to needs that presumably can be satisfied by the confident advance of human mastery over nature. Further analysis of HRC would also show that beyond the development of skills for evading hardship, the most obvious “solution” to “kesoesahan” in HRC is “pertolongan” (“help,” whether from God or from other human beings). According to W. J. S. ­Poerwadarminta (1976), “pertolongan” means “perbuatan atau sesuatu yg dipakai untuk menolong” (an act or something used to help). An example is “mendapat pertolongan dari dr penduduk kampung” (to receive help from the doctor of the inhabitants of the village). Out of 21 usages of the word “kesoesahan,” eight collocate with “pertolongan” (see Tables 3.1, 3.2, and 3.3). There is apparently no surface collocational structure corre­sponding to this in RDJ. Though the social and religious themes of “help” are not completely excluded in RDJ, the tendency in HRC contrasts strongly with RDJ in its focus on ethical competence rather than the almost completely excluded notion of techno­logical competence in overcoming hardships, resolving the problem of lack of resources, or mastering nature. If the life situation is below the norm, then HRC points to “pertolongan” (help/aid) as the always-dependable solution for human beings. It can be noticed that the same sentence as translated in HRC once again contains a collocation of “kesoesahan” and “pertolongan.” Here, Robinson pleads for the “pertolongan” of God so that he can “suffer” (Mal: menderita) the extreme difficulties he faces (Mal: kesoesahan jang terlampau berat) “patiently” (Mal: sabar). On the other hand, the version in ABR uses two words to describe the attitude toward “suffering”/“hardship” (Tag: cahirapan), namely, “to bear” (Tag: pagtiis) and “to endure” (Tag: pagbata). However, “pagtiis” and “pagbata” do not exhaust this theme in ABR. In addition, a person needs “strength of the will” (Tag: catibayan nang loob) in order to be able to bear and endure for an extended period. “Catibayan nang loob” here does not necessarily pertain to an “active will” but leans more to a kind of “passive will” to “endure” everything for as long as necessary. 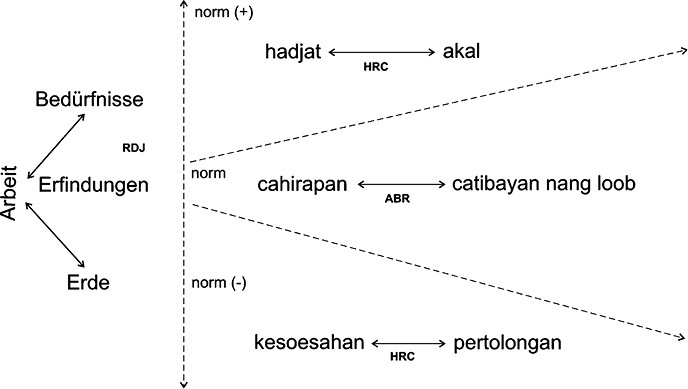 It has been observed that HRC is unique in relation to ABR and RDJ in its emphasis on “pertolongan”; for its part, ABR seems to dwell on the notion of enduring suffering more than either RDJ or HRC. Given the wealth of its lexicalizations on this theme, ABR can be said to have an “elaborated code” on “suffering” as opposed to the relatively “restricted codes” of HRC and RDJ. A third example (see Table 6) may lend further insights into the discursive specificity of ABR. This section has not been translated in HRC since it is part of the discarded framing story of RDJ. However, this particular quotation is particularly important because it represents a short exposition of the basic core of Campe’s educational philosophy as embodied in the term “Selbstüberwindung” (self-overcoming). According to Campe, the development of the capacity to postpone satisfaction or deprive oneself voluntarily of immediate desires in an “overcoming” of the self can strengthen one’s personality so that every difficulty in the future can be faced with “gelassener Standhaftigkeit” (calm resolve). The term “Selbstüberwindung” is not translated directly in ABR but rather substituted with an explanatory translation as the condition of being “accustomed to the lack of whatever comfort even that which you most desire.” The phrase in RDJ “stark am Geist und Herzen” (strong in spirit and heart) is translated in ABR as “catibayan nang loob” (strength of the loob), and “gelassener Standhaftigkeit” (calm resolve) is translated as “matitiis na mapayapa” (can be endured calmly). While RDJ does not specify what shall or must be “endured in calm resolve,” ABR collocates “catibayan nang loob” here with “cahirapan” (difficulty) and “caralitaan” (poverty). It could be asserted that the main semantic polarity in ABR is “cahirapan” (difficulty/poverty) versus “catibayan nang loob” (strength of the will). The other categories of political economy (“exchange value,” “use value,” “division of labor,” “abstract labor,” “socially necessary labor time”), which so tightly cohere in RDJ as various aspects of human-nature metabolism, therefore seem to fall away in HRC. HRC represents a position that depends upon ethical and social solutions to exceptional situations of scarcity, adversity, and deprivation. In a hypothetical situation of limited needs, where sufficient means exist to supply these needs for a community, this is perhaps not an unusual outlook. The explanation for the particular discursive elements in ABR may most likely reflect the fact that the delicate balance between the limited needs and sufficient means has been interrupted by the deprivation of these previously adequate means, for example, by extractive colonialism. The aim of ABR in Tagalog as an even more emphatically moral-religious treatise was, as with many deeply ideological works in the colonial religious canon, the preaching of endurance and suffering within the context of colonial exploitation. The experiences of “kesoesahan” and “cahirapan” in HRC and ABR are qualitatively different from the “relative impoverishment” occurring in societies of developed industrial production since the revolution of “needs” had not yet taken place within their material and discursive worlds. That is to say, the “deprivation of means” by means of “primitive accumulation” had taken place before the notion of “unlimited needs” corresponding to notions of “relative impoverishment” could arise. Indeed, one can speculate whether RDJ, ABR, and HRC could be read more broadly as articulations of various kinds of responses to “capitalist modernity.” Another textual exploration would be necessary to work it out, but following the philosopher Bolívar Echeverría’s (2000) characterization of the four ethe of modernity, RDJ could be said to fluctuate between the romantic and realist types while ABR represents more distinctly a classical ethic; finally, HRC very roughly corresponds, only by analogy, with the baroque ethic. The solution in RDJ to fulfilling human needs is the development of adequate technical means and the attainment of efficient productive organization. In other words, the means by which societal prosperity is to be achieved is not through social struggle but through the struggle to dominate nature. In contrast to this, the solution to “kesoesahan” and “cahirapan” in the colonial contexts of HRC and ABR seems to be the continual development of various discourses of critique in combination with various kinds of oppositional practice. What if “pertolongan” was inflected to mean the collective action of the “rakjat” (people) against the colonial oppressor? What if “catibayan nang loob,” instead of being conceived as a passive acceptance of one’s fate, becomes understood as the strength of the will to overcome the “hardships” (cahirapan) of the struggle in pursuit of the “himagsikan” (revolution)? 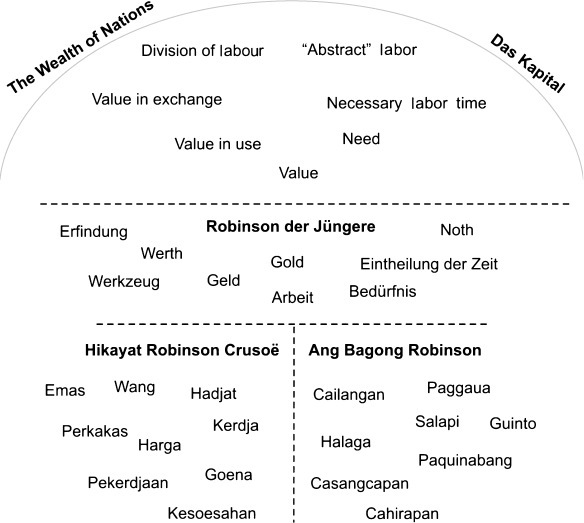 Some evidence has been shown elsewhere, at least for the Tagalog case, that these types of critique would eventually articulate with and form connections with the discourses specific to the nationalist struggle (Guillermo 2009b) and eventually also with notions of labor and production within the discourse of the early radical labor movements (Guillermo 2009a). In these early receptions, the discourses of political economy presented in RDJ would therefore not simply be abrogated or rejected but rather be reimagined and reconfigured discursively in a new constellation in which conceptions of exploitation and liberation would displace the centrality of ideas of technical progress and mastery over nature. Unfortunately, although the history of European political and economic concepts and categories has been well studied, there are as yet no comprehensive and encyclopedic studies on this theme with respect to Philippine and Indonesian languages. This paper may be regarded as a small contribution to this field. Grants from the Asian Public Intellectual Program and the Deutsche Akademische Austauschdienst, along with the support of the Department of Filipino and Philippine Literature, University of the ­Philippines–Diliman, allowed me to undertake this research. For their intellectual generosity and helpfulness, I would like to thank Melani Budianta and Syahrial from the Fakultas Ilmu Budaya, Universitas Indonesia, and Caroline Hau and Shimizu Hiromu from the Center for Southeast Asian Studies, Kyoto University. For sharing with me important materials, I am grateful to Elmer Nocheseda, Waruno Mahdi, and Cheng-Chung Lai. Baur, Gustav. 1876. Campe, Joachim Heinrich. In Allgemeine Deutsche Biographie [General German biography], Vol. 3, edited by the Historischen Kommission bei der Bayerischen Akademie der Wissen­schaften, pp. 733–737. Leipzig: Duncker and Humblot. Bautz, Friedrich-Wilhelm. 1990. Campe, Joachim Heinrich. In Biographisch-Bibliographischen Kirchen­lexikons [Biographical-Bibliographical Church lexicon], Vol. 1, pp. 237–272. Hamm: Bautz. Berger, Michael. 2003. Karl Marx: Das Kapital [Karl Marx: Capital]. München: UTB Fink. Bidet, Jacques. 2007. Exploring Marx’s Capital. Leiden: Brill. ―. 2004. Commentaire du Capital [Commentary on Capital]. Accessed April 23, 2010, http://pagesperso-orange.fr/jacques.bidet/indexl.htm. Biernacki, Richard. 1995. The Fabrication of Labor: Germany and Britain, 1640–1914. California: University of California Press. Blamires, David. 2009. Telling Tales: The Impact of Germany on English Children’s Books 1780–1918. Open Book Publishers, online. Budianta, Melani. 2002. In the Margin of the Capital: From ‘Tjerita Boedjang Bingoeng’ to ‘Si Doel anak sekolahan’. In Clearing a Space: Postcolonial Readings of Modern Indonesian Literature, edited by Keith Foulcher and Tony Day, pp. 237–272. Leiden: KITLV. Campe, Joachim Heinrich. 1910. Hikajat Robinson Crusoë [The saga of Robinson Crusoe]. Composed in Bahasa Melayu by A. F. von Dewall following the Dutch translation. 8th ed. Betawi: Pertjetakan Gouvernement. ―. 1880. Ang Bagong Robinson, historiang nagtuturo nang mabubuting caugalian, na guinauang tanungan nang icatuto at icalibang nang manga batang babayi,t, lalaqui [The new Robinson, a story that teaches good conduct, that has been made into a question and answer form so that girls and boys can learn and be entertained], Vol. 2. Translated into Spanish by Tomás de Iriarte and translated into Tagalog by Joaquin Tuason. Manila: Imprenta del Colegio de Santo Tomás. ―. 1879. Ang Bagong Robinson, historiang nagtuturo nang mabubuting caugalian, na guinauang tanungan nang icatuto at icalibang nang manga batang babayi,t, lalaqui [The new Robinson, a story that teaches good conduct, that has been made into a question and answer form so that girls and boys can learn and be entertained], Vol. 1. Translated into Spanish by Tomás de Iriarte and translated into Tagalog by Joaquin Tuason. Manila: Imprenta del Colegio de Santo Tomás. ―. 1869. Geschiedenis van Robinson Crusoe verkort, en tot het school en huislyk gebruik geschikt gemaakt [The abridged story of Robinson Crusoe, adapted for school and home use]. Translated from the French by Gerard Keller. Te Vlissingen: J. I. Corbelyn. ―. [1779–80] 1837. Robinson der Jüngere. Ein Lesebuch für Kinder [The new Robinson: A storybook for children]. 28th ed. Braunschweig: Verlag der Schulbuchhandlung. ―. 1820. El nuevo Robinson, historia moral, reducida á dialogos para instruccion y entretenimiento de niños y jovenes de ambos sexos [The new Robinson, a moral story, reduced into dialogs for the instruction and entertainment of children and young people of both sexes]. Translated into Spanish with various corrections by Tomás de Iriarte, 2 vols. Madrid: Librería de Cormon y Blanc. ―. 1809. 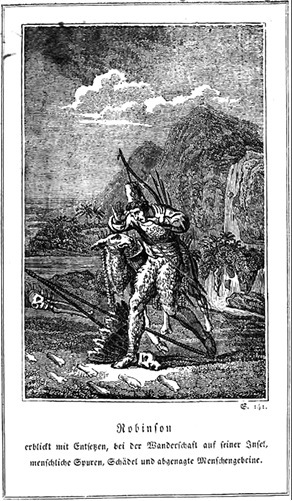 Histoire abrégée de Robinson Crusoë [Abridged history of Robinson Crusoe]. Zutphen: Chez H.C.A. Thieme. ―. 1785. Von der nöthigen Sorge für die Erhaltung des Gleichgewichts unter den menschlichen Kräften. Besondere Warnung vor dem Modefehler die Empfindsamkeit zu überspannen [On the necessary concern for the preservation of balance among the human powers: A word of caution on the mistaken fashion to overexcite sensitivity]. In Allgemeine Revision des gesamten Schul- und Erziehungswesens. Von einer Gesellschaft praktischer Erzieher [General reform of the whole system of education and upbringing: From a society of practicing educators], Vol. 3, edited by Joachim Campe, pp. 291–434. Hamburg, Wolfenbüttel, Wien, Braunschweig: Verlag der Schulbuchhandlung. ―. 1779. Robinson der Jüngere: Zur angenehmen und nützlichen Unterhaltung für Kinder [The new Robinson: Agreeable and useful entertainment for children], Vol. 1. Hamburg: Editor Bohn. CCP Encyclopedia of Philippine Art. 1994. Manila: Cultural Center of the Philippines. Chambert-Loir, Henri, ed. 2009. 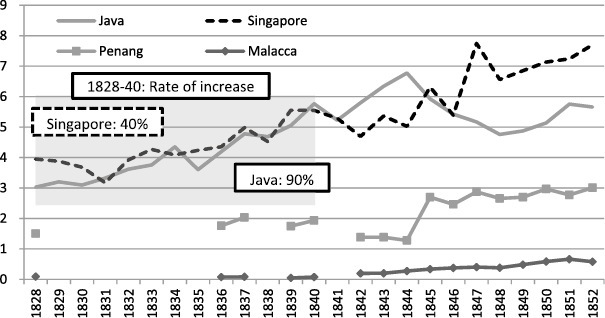 Sadur, Sejarah Terjemahan di Indonesia dan Malaysia [Adaptation, the history of translation in Indonesia and Malaysia]. Jakarta: Kepustakaan Populer Gramedia. Conze, Werner. 1972. Arbeit [Work]. In Geschichtliche Grundbegriffe. Historisches Lexikon zur politisch-sozialen Sprache in Deutschland [Basic historical concepts: Historical lexicon of the political and social language of Germany], Vol. 1, edited by Werner Conze, Otto Brunner, and Reinhart Koselleck, pp. 154–215. Stuttgart: Klett-Cotta. Dewan Bahasa dan Pustaka Brunei. 2003. Kamus Bahasa Melayu Nusantara [Dictionary of insular Bahasa Melayu]. Brunei: Dewan Bahasa dan Pustaka Brunei, Kementerian Kebudayaan. Echeverría, Bolívar. 2000. La modernidad de lo barroco [The modernity of the baroque]. Mexico: ­Biblioteca Era, Ediciones Era. Erämetsä, Erik. 1961. Adam Smith als Mittler englisch-deutscher Spracheinflüsse [Adam Smith as an agent of English-German linguistic influence]. In Toimituksia: Annales, Series B. Helsinki: ­Suomalainen Tiedeakatemia. Foster, John Bellamy. 2000. Marx’s Ecology: Materialism and Nature. New York: Monthly Review Press. Foulcher, Keith; and Day, Tony, eds. 2002. Clearing a Space: Postcolonial Readings of Modern Indonesian Literature. Leiden: KITLV. Galang, Zoilo M., ed. 1950–58. Encyclopedia of the Philippines. Manila: Exequiel Floro. Grossman, Henryk. 1935. Die gesellschaftlichen Grundlagen der mechanistischen Philosophie und die Manufaktur [The social basis of mechanistic philosophy and manufacture]. Zeitschrift für Sozialforschung [Journal of social research] Jg. IV. H. 2: 161–231. Guillermo, Ramon. 2013. A Pouring Out of Words: Das Kapital in Bahasa Indonesia Translation. Kritika Kultura 21/22: 221–240. Accessed November 5, 2013, http://journals.ateneo.edu/ojs/index.php/kk/article/view/KK2013.02128/1707. ―. 2009a. Pook at Paninindigan: Kritika ng Pantayong Pananaw [Site and standpoint: A critique of the “We Perspective”]. Quezon City: University of the Philippines Press. ―. 2009b. Translation and Revolution: A Study of Jose Rizal’s Guillermo Tell. Quezon City: Ateneo de Manila University Press. Hausmann, Gottfried. 1957. Campe, Joachim Heinrich. In Neue Deutsche Biographie (NDB) [New German biography], Vol. 3, p. 110ff. Berlin: Duncker & Humblot. Heinrich, Michael. 2009. Wie das Marxsche “Kapital” lesen? [How to read Marx’s Kapital?]. Stuttgart: Schmetterling Verlag. Hindrichs, Gunnar. 2010. Arbeitsteilung und Subjektivität [Division of labor and subjectivity]. In Die deutsche Ideologie. Klassiker Auslegen [The German ideology: Interpreting the classics], edited by Harald Bluhm, pp. 117–132. Berlin: Akademie Verlag. Jedamski, Doris. 2009. Terjemahan Sastra dari Bahasa-Bahasa Eropa ke dalam Bahasa Melayu sampai Tahun 1942 [Translations of literature from European languages to Bahasa Melayu until 1942]. In Sadur, Sejarah Terjemahan di Indonesia dan Malaysia [Adaptation, the history of translation in Indonesia and Malaysia], edited by Henri Chambert-Loir, pp. 171–204. Jakarta: Kepustakaan Populer Gramedia. ―. 2002. Popular Literature and Postcolonial Subjectivities: Robinson Crusoe, the Count of Monte Cristo and Sherlock Holmes in Colonial Indonesia. In Clearing a Space: Postcolonial Readings of Modern, edited by Keith Foulcher and Tony Day, pp. 19–48. Leiden: KITLV. Jones, Russell. 2008. Loan-words in Indonesian and Malay. Jakarta: KITLV-Jakarta, Yayasan Obor Indonesia. Koentjaraningrat. 2009. Gotong Rojong: Some Socio-anthropological Observations on Practices in Two Villages of Central Java. Singapore: Equinox Publishing. Manuel, E. Arsenio. 1955. Tuason, Joaquin. In Dictionary of Philippine Biography, Vol. 1, pp. 461–468. Quezon City: Filipiniana Publications. Marizzi, Bernd. 2008. El nuevo Robinsón de Joachim Heinrich Campe, en la traducción de Tomás de Iriarte (1789) [The New Robinson of Joachim Heinrich Campe, in the translation of Tomás de Iriarte (1789)]. Alicante: Biblioteca Virtual de Cervantes. Accessed April 23, 2010, http://www.cervantesvirtual.com/servlet/SirveObras/12482517557023753087624/p0000001.htm#I_0_. Marx, Karl. 2004. Kapital: Sebuah Kritik Ekonomi Politik [Capital: A critique of political economy], translated by Oey Hay Djoen. Jakarta: Hasta Mitra. ―. 1976. Capital Volume I [Capital, Vol. I]. Translated by Ben Fowkes. Harmondsworth: Penguin Books. ―. 1961. Capital Volume 1 [Capital, Vol. 1]. Translated by S. Moore and E. Aveling. Moscow: Foreign Language Publishing House. ―. 1956. Das Kapital [Capital], Vol. 1. Werke [Works], Vol. 23. Berlin: Dietz Verlag. ―. 1933a. Modal [Capital]. In Daulat Ra’jat [People’s sovereignty], No. 62. Tahoen ke-III: 70–71. ―. 1933b. Modal [Capital] (II). In Daulat Ra’jat [People’s sovereignty], No. 60. Tahoen ke-III: 54–55. ―. 1933c. Modal [Capital]. In Daulat Ra’jat [People’s sovereignty], No. 58. Tahoen ke-III: 38–39. Mizuta, Hiroshi, ed. 2000. Adam Smith: Critical Responses, Vol. 5. London and New York: Routledge. Mizuta, Hiroshi; and Sugiyama, Chuhei, eds. 1993. Adam Smith: International Perspectives. New York: St. Martin’s Press. Mojares, Resil. 2006. Brains of the Nation: Pedro Paterno, T. H. Pardo de Tavera, Isabelo de los Reyes and the Production of Modern Knowledge. Quezon City: Ateneo de Manila University Press. ―. 1998. Origins and Rise of the Filipino Novel: A Generic Study of the Novel until 1940. Quezon City: University of the Philippines Press. Molhuysen, P. C.; and Blok, P. J., eds. 1930. Nieuw Nederlandsch biografisch woordenboek [New Dutch biographical lexicon], Vol. 8. Leiden: A. W. Sijthoff. Müller, Johann Baptist. 1973. Bedürfnis, Bedarf und Bedürfnissteigerung im ökonomischen Bereich [Need, necessity, and the escalation of needs in the economic arena]. In Geschichtliche Grundbegriffe zur politisch-sozialen Sprache in Deutschland [Basic historical concepts: Historical lexicon of the political and social language of Germany], Vol. 1, edited by Otto Brunner, Werner Conze, and Reinhart Koselleck, pp. 440–489. Stuttgart: Klett-Cotta. Poerwadarminta, W. J. S. 1976. Kamus Umum Bahasa Indonesia [General dictionary of Bahasa Indo­nesia]. Jakarta: PN Balai Pustaka. Pramoedya Ananta Toer. 2009. Bukan Pasar Malam [Not an all night’s market]. Jakarta: Lentera Dipantara. Proudfoot, Ian. 1997. Robinson Crusoe in Indonesia. Asia-Pacific Magazine 6 and 7: 42–48. Pym, Anthony. 2010. Attempt at a Chronology of Hispanic Translation History. Accessed March 23, 2010, http://www.tinet.cat/~apym/on-line/chronology/18.html. Quirino, Carlos. 1995. Who’s Who in Philippine History. Manila: Tahanan Books. Rousseau, Jean-Jacques. 1882. Émile, ou De l’éducation, extraits comprenant les principaux éléments­ pédagogiques des trois premiers livres [Emile, or the education, extracts making up the principal pedagogical elements of the first three books]. With an introduction and notes by Jules Steeg. Paris: Librarie Hachette. Sahlins, Marshall. 1974. Stone Age Economics. New York: Aldine. Schnabel, Johann Gottfried. 1994. Insel Felsenburg [The island of Felsenburg]. Ditzingen: Reclam. Smith, Adam. 1904. An Inquiry into the Nature and Causes of the Wealth of Nations, edited by Edwin Cannan. London: Methuen. Stach, Reinhard. 1996. Robinsonaden: Bestseller der Jugendliteratur [Robinsonades: Bestseller of literature for the young]. Hohengehren: Schneider-Verlag Hohengehren. Sun, Guang-Zhen, ed. 2004. Readings in the Economics of the Division of Labor: The Classical Tradition. Hackensack: World Scientific. Tribe, Keith. 2000. The “Smith Reception” and the Function of Translation. In Adam Smith across Nations: The Translation and Reception of “The Wealth of Nations,” edited by Cheng-Chung Lai, pp. 127–145. Oxford: Oxford University Press. ―. 1995. 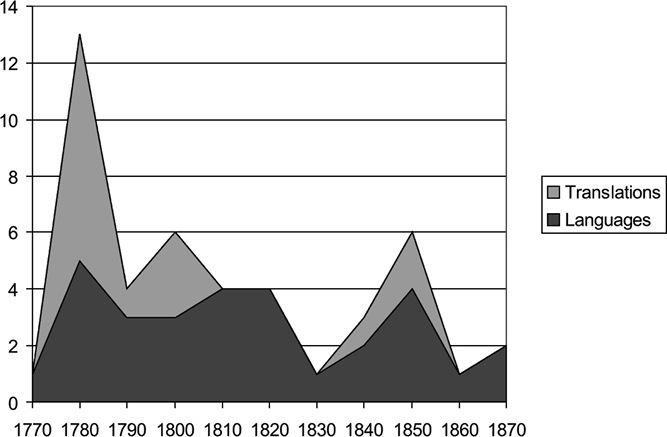 Strategies of Economic Order: German Economics 1750–1950. Cambridge: Cambridge University Press. Ullrich, Hermann. 1898. Robinson und Robinsonaden. Bibliographie, Geschichte, Kritik. Ein Beitrag zur vergleichenden Literaturgeschichte, im besonderen zur Geschichte des Romans und zur Geschichte der Jugendliteratur. Teil 1. Bibliographie [Robinson and Robinsonades: Bibliography, history, criticism: A contribution to comparative literary history, particularly to the history of novels and the history of literature for young people, Part 1, bibliography]. Weimar: Emil Felber. UNESCO, Index Translationum: World Bibliography of Translation. Accessed November 4, 2013, http://portal.unesco.org/culture/en/ev.php-URL_ID=7810&URL_DO=DO_TOPIC&URL_SECTION=201.html. Waruno Mahdi. 2006. The Beginnings and Reorganisation of the Commissie voor de Volkslectuur (1908–1920). In Insular Southeast Asia: Linguistic and Cultural Studies in Honour of Bernd Nothofer, edited by Fritz Schulze and Holger Warnk, pp. 85–110. Wiesbaden: Harrassowitz Verlag. Waszek, Norbert. 1993. Adam Smith in Germany, 1776–1832. In Adam Smith: International Perspectives, edited by Hiroshi Mizuta and Chuhei Sugiyama, pp. 163–180. New York: St. Martin’s Press. Watt, Ian. 1996. Myths of Modern Individualism: Faust, Don Quixote, Don Juan, Robinson Crusoe. Cambridge: Cambridge University Press. Wegehaupt, Heinz. 1991. Robinson und Struwwelpeter. Bücher für Kinder aus fünf Jahrhunderten. Konzeption und Katalog [Robinson and Struwwelpeter: Books for children from five centuries; Conception and catalog]. Berlin: Deutsche Staatsbibliothek. Wilkinson, R. J. 1919. Malay-English Dictionary. Singapore: Kelly & Walsh Ltd.
Wood, John C. 1983. Adam Smith: Critical Assessments, Vol. 2. London and Canberra: Croom Helm. 1) An example of this is the following: “Asking forgiveness from the beautiful and merciful Virgin that she should watch over him in that remote place, that no one should hurt him, he renewed his hope in the Mother of Mercy, who is the most powerful intermediary to her Son: since this blessed Virgin is his beloved Mother and support in all of his suffering when He was alive in this world. He also called upon his beloved Saints Joseph and Archangel Rafael” (Nagmamacaauà naman sa maalindog at mapagcalarang Virgen na siya,y, calingain sa iláng na yaon, na ualang sucat macasamang sinoman; pinagtibay niya ang pag-asa sa Ina nang auà, na siyang lalong malacas na taga pamamaguitan sa caniyang Anac: yayamang ang mapalad na Virgeng ito ang pinacaibig niyang Ina at caramaydamay sa madlang cahirapan nang siya,y, nabubuhay dito sa lupà. Nanauagan naman sa maloualhating cay S. José at sa Arcangel S. Rafael na caniyang manga pintacasi) (Campe 1879, 91). 4) “If a London merchant, however, can buy at Canton for half an ounce of silver, a commodity which he can afterwards sell at London for an ounce, he gains a hundred per cent by the bargain, just as much as if an ounce of silver was at London exactly of the same value as at Canton” (Smith 1904, 40). 6) “Adversity forced him to precisely divide up his time among his different functions. The fact that one takes up a greater portion, and another less of his total work depends on the greater or lesser difficulty necessary to attain the desired effect” (Die Not selbst zwingt ihn, seine Zeit genau zwischen seinen verschiednen Funktionen zu verteilen. Ob die eine mehr, die andre weniger Raum in seiner Gesamttätigkeit einnimmt, hängt ab von der größeren oder geringeren Schwierigkeit, die zur Erzielung des bezweckten Nutzeffekts zu überwinden ist) (Marx 1956, 90–91). 7) Although Smith does not explicitly conceptualize “socially necessary labor,” it could be argued that he gives various inklings of it in WN. 11) This can be compared to Iriarte’s comment in his “Prologo”: “Nothing is more praiseworthy in this work than the healthy moral doctrine laid out in the whole of it. Inspire love, gratitude and respect to the supreme Creator and Father of human beings, enter with limitless faith into the adversities which he sends us, and an impervious humility which separates us from the temerity of wanting to understand and more or less judge, his inscrutable judgment: excellently portrays the misery and needs of human beings in this world . . .” (Nada hay tan loable en esta obra como la sana doctrina moral oportunamente sembrada en toda ella. Inspira amor, gratitud y respeto al supremo Criador y Padre de los hombres, suma confianza sin límite en las adversidades que nos envía, y una ciega humildad que nos aparte del temerario designio de querer penetrar y muchos ménos calificar, sus inscrutables juicios: pinta excelentemente la miseria y necesidades del hombre en este mundo . . .) (Campe 1820, VII).